Keep safe using your small petrol engine from Aztex Equipment. In our last post, we covered some basic tips on protecting us from fires and explosions, when working with petrol engines. We also covered use on containers and some other points. We carry on from there. Some may disassociate the air filter with fuel — air is harmless, of course — but it’s important to use care when working on an air cleaner since the foam filter, when present, may be saturated with fuel, oil or kerosene. Whenever possible, avoid repairing or testing an engine in an area with materials that may ignite. 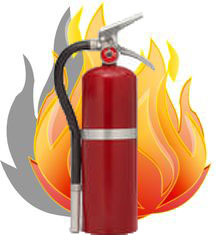 Ensure fire extinguishers are present, charged and easily accessible so that any fire that may occur can be quickly extinguished. Obviously, anything hot enough to spark will cause serious burns when coming in contact with skin. Always allow an engine to cool before doing any maintenance checks or repair work, and change oil when an engine is warm, but not hot! Wait until the engine has cooled completely before refuelling, since any gas spilled on a hot cylinder could start a fire, as well. Now, we should also consider where an engine will be repaired or tested. We’ll look at this on our next post, plus cover some other points.